CoreMathJam 6th grade takes learning and standards mastery to a whole new level. 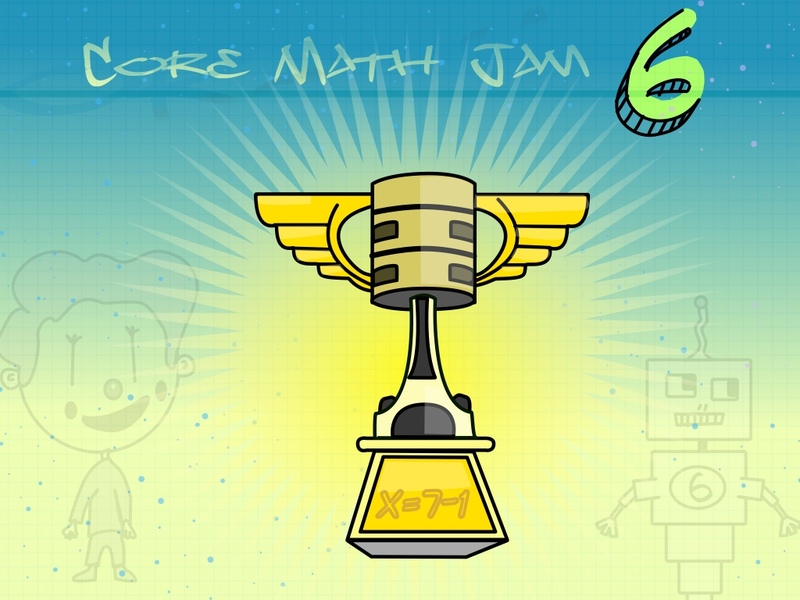 Built around the Common Core Standards, CoreMathJam lets students practice and prepare for those yucky tests, while having fun earning points and achievements, and moving through three different mastery levels in all of the Math domains. Core Math Jam was built by teachers who spent hours trying to prepare their students for success in today’s achievement-centered, data-driven classrooms. We wanted to put our own curriculum used by our students into an app for all to use. Dozens of questions per strand are inspired by grade level interest. Students get a mix of questions, tagged as easy, medium and hard. Once a student passes a particular item, that item will be reshuffled. If the student answers that same item later, it is considered ‘Mastered’ and the student no longer needs to answer it. The goal is to have students get as many questions mastered and removed from their list. This focuses the students’ time on those items that are more problematic. CMJ learns when a student has mastered or is having trouble with a standards and will present with students with items they are having trouble with, or have not yet mastered. When a student answers a question correct, it will be tagged as passed and gets reshuffled. When a student answers that item again correctly, they will ‘Master’ it and won’t have to see that same item ever again. Over time, students will spend more time on items they are having difficulty with and those they have mastered will available for review, but will not be part of the standards practice. The goal is for students to master all standards within a strand. Students have the option to draw on the screen to work out the problems, make visual organizers or represent their thinking. As they move through each level, students can earn points and awards. Points can be redeemed to upgrade their avatars. Available soon in the Apple iTunes store, and as an Android and web app.